Excel Esports has teamed up with their sponsor HP Omen to gift one of their fans with brand new gaming monitor! 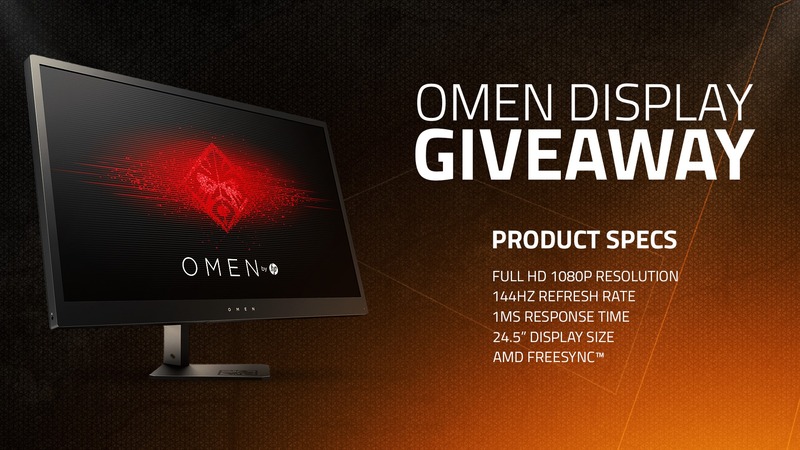 To enter in their latest OMEN by HP 25 Full-HD LED Gaming Display Giveaway grab your free entries by following few simple steps listed down below! Dodge the hook. Steal the objective. Explode with high voltage. 144Hz refresh rate and a 1ms response time reduce input lag and jumpstart the fury you bring to each match. With AMD FreeSync Technology you can focus on the objective without blurring or tearing holding you back from obliterating your opponent’s backline. Get smooth gaming, sharper objects, and cleaner details with a gaming display that refreshes frames 144 times a second – over twice the refresh rate of standard displays. Enjoy the latest action movie or high-octane video game with the low pixel latency and snappy response times of this TN panel. Connection options for your entire gaming arsenal. With 1 DisplayPort, 2 HDMI, 2 USB 3.0 ports, and a convenient hook for your headset, you’re always ready for action. To stay up to date with all giveaways from the web Like GiveawayBase Facebook Page, follow GiveawayBase on Twitter or subscribe on GiveawayBase Youtube channel! STEP 2 – Log in to a giveaway widget with your Facebook, Twitter or email account. STEP 3 – Finish the tasks listed in the widget to grab your free entries. Bonus entries: Share your referral link with friends to get additional 2 entries for each person who enter through the link. Not known how winners are going to be contacted, probably by email and announced in giveaway widget.